Aren't we always looking for a creative way to work on shapes and letters? I know I am! 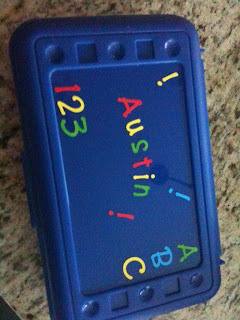 A little while ago I made my daughter this activity box and she fell in love with it. So I made one for her friend who is also working on letters and shapes these days. It turned out rather darling and I thought I would share it with you! It is super easy to make and a great gift idea as well. 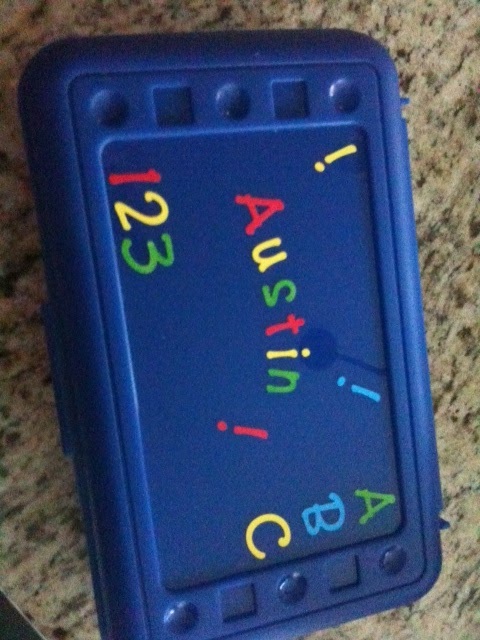 In the photo above is a cute little pencil box that I decorated with stickers. Very simple. 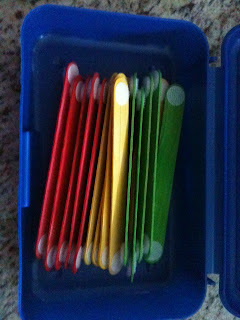 there are around 15 - 20 craft sticks in assorted colors. I placed Velcro circles at the end of each stick, on both sides. Such a simple concept, yet a great deal of fun. This idea was shared with me back in 2007 by the amazing Miss Gene. My preschoolers loved this and now my baby girl does too! Thanks Miss Gene, I miss you!! Please note (as stated in my disclaimer) that all activities on this blog are intended to be executed under adult supervision. You must be the judge of what is age appropriate for your child. Love this idea! Plan to make some for my little guy soon. Stopped in from Sharing Saturday and now following you on GFC. What a simple, fun, & ingenious activity!! Love it :) Thanks so much for sharing your creativity with us on Sharing Saturday. I just wanted to let you know I featured this at TGIF Linky Party here - http://livinglifeintentionally.blogspot.com/2012/01/tgif-linky-party-13.html - Feel free to stop by and grab an I was featured button and link up again this week! Thanks for sharing your creativing with all of us!! From TGIF. Great idea! Though I see mine making crazier things than letters or simple shapes - not a bad thing! I LOVE this idea! 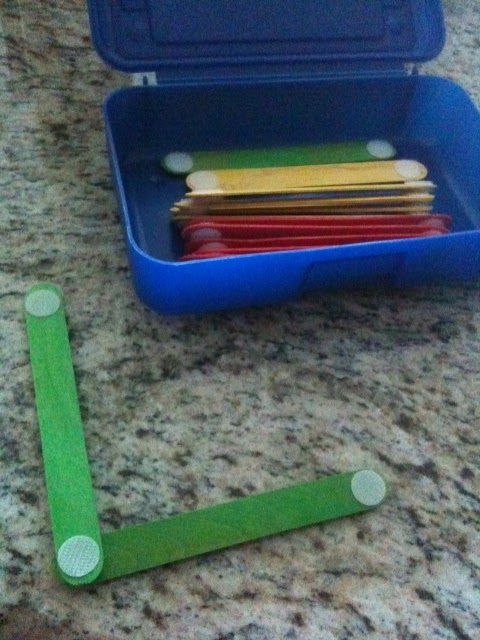 And I just so happen to have some craft sticks and velcro. Thanks for the inspiration! Think I might let my kiddos decorate their own sticks. we have done this but the addition of the velcro is fabulous! Thanks for sharing on the Sunday Showcase - hope to see you this week. This is such a great idea! Thanks for sharing! Hi Jen! I bought the sticks at Michaels, you can also find the colored jumbo sticks on Amazon. Happy Playing & Exploring!! Love these! My 7yo daughter goes through bags and bags of craft sticks...gluing them together to make fairy houses, inventions, puppets and masks, you name it! This will be a great way to reuse them and reduce waste. Thanks so much! I have just made some of these and blogged about them! Such a great idea, thanks for sharing! Thank you for your idea! I will do this to help my kids create shapes in class. Thanks for sharing! I will be checking my sewing drawers when I get home for Velcro as my girls would love this idea! If not, we will stop at Walmart when run out later today. Thanks again for sharing! We made some of these yesterday. I think I've been having more fun with them than my 2.5 year old son, but they did distract him from a tantrum yesterday, so I'd say they're a success! 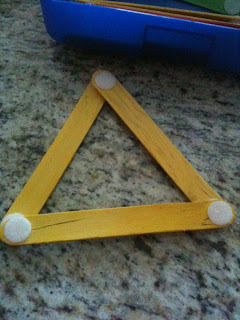 I was just at Micheal's the other day and saw those popsicle sticks, I should have picked some up. Oh well, guess it just gives me an excuse to go back! My son will love this! Thanks for sharing. Please do not copy entire posts from Tot Treasures without written permission from the blog's author. If you use any photos from this blog, please attach a link to the post that correlates with the photo used. 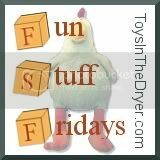 I hope we inspire you to try these activities and share what you love, when and if you do please link it back to Tot Treasures!